Haegwan Kim- First, tell me about your personal definition of success. Anupam Kher- Success definition keeps changing over years. You can’t have the same definition of success all your life. Success as a struggling actor for me when I was looking for work to get into movies, success for me was becoming an actor. When I became an actor, success for me was getting an award, becoming more successful. So it’s completely different. Today, for me success is more important to do as a person. To me, success is about not greed; that you should not be greedy. Today, the success for me is to be able to be yourself. Today, the success means to me that you should deal with life simply. And today, success for me is to be able to change people’s lives through my work, through my deeds, through my thoughts. It’s a very fixed thing to say that this is what success to me is. It’s very difficult for me to describe success. Success is achieving something. Now what do you achieve as a person, as a professional? And success is always related to happiness. But materialistic success, spiritual success, that depends from people to people. Haegwan Kim- So when people get older, their success become more outside-oriented? Anupam Kher- Not with everybody else. People are greedy at the age of 70. In India, there are father-in-laws, mother-in-laws who kill their daughter for money. It depends how evolved you are as a person. It depends from people to people. Age has nothing to do with success or the thought. If that was the case, then we would have had no problems in history. 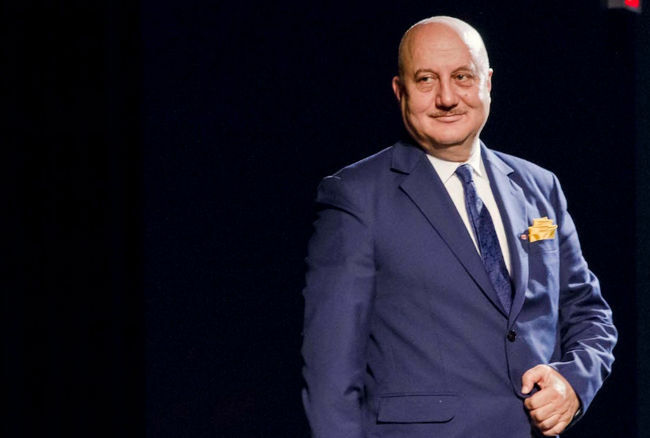 Anupam Kher- All the prime ministers and presidents are old. All the dictators are old, so they have not understood the meaning. It is what makes you an evolved person. To me, life is about reinventing yourself. You have to keep reinventing. So that’s what is important. Haegwan Kim- You teach for many superstars of the future. So I’d like to ask about a key element to be a successful actor? Anupam Kher- There is no alternative to honesty and hard work in any profession. That’s what I believe in. You have to be honest and you have to be hard working. There are no short cuts. Short cut successes are for just short term. I’ve been in movies for the last 26 years and done about 400 films. I am still working. If I compare myself with the success of Amitabh Bachchan, then I’m not successful, but if I compare myself with so many people who are wanting to be successful, then I’m a very successful person. But I have maintained that I have to be hard working and I have to be honest with my profession, and then success will happen to me. It’s a matter of time. Also, success comes with attitude, not with talent. It’s what your attitude towards life is. Haegwan Kim- Talent comes later? Anupam Kher- Yes, talent comes later. First attitude comes. Attitude gets you work; attitude gets you singled out. Haegwan Kim- You teach, have a foundation and working for many social goods. Do you have any obligation for that? Anupam Kher- No. I want to grow as a person. I want to be rich in my mind. Bill Gates decides to give almost of his wealth. I don’t think he’s giving it only to pay back to the society, that’s what he feels. That’s what makes him happy. Foundation work, I work with mentally challenged children, it makes me happy. I’m doing it for selfish own reasons. You want to feel better. More than anybody else you are doing it for yourself. As I said earlier, life is about growing up. You have to grow up as a person. If you don’t grow up as a person, then how can you grow up as a professional? Haegwan Kim- That’s true. I came here in India, so I want to ask about Indian philosophy on success. Anupam Kher- We are a very young country. We are only 63 years old.